The Farmhouse at 30542 is a farm wedding and event venue owned and operated by Roger and Cathy Little. Roger is a Hall County native and has grown up living in Flowery Branch on the 70 acre farm. He was a Johnson High School graduate in 1974, and then went on to help his father, Lloyd, in the family business. Little-Woodall Supply is a wholesale distributer of farm and veterinarian supplies. They served independent farm stores in the tri-state area for 44 years. In 1987, Cathy and Roger met on a cross country bicycle ride to raise funds for the American Lung Association. They married the next year and made their home on the family farm. Being a city girl from Dalton, GA, and then Atlanta, Cathy had a lot to learn about country living. Cathy is an Auburn University graduate in graphic design has held many job titles to gain the experience needed to develop a farm wedding venue. She now considers herself an artist/designer/illustrator/marketer and farm wife always up for the next adventure and challenge. In 2014, the couple began renovating Roger's boyhood home which had been heavily vandalized and vacant for years. The road to this point has not been easy but staying true to each other and with God’s guidance, the pieces of the work-in-progress farm venue have fallen into place. Each little project has slowly brought the property back to life and the vision of the farm venue into reality. After countless repair projects, fence building, and construction coordination, there is now a usable 2500 square foot farmhouse on 43 acres of farmland approved for wedding use! The very first wedding was held on June 4th 2016 and before it, a few other small wedding events and parties. The Little's are the caretakers for the property. They live on the adjacent 26 acres, tending the cattle that you can see grazing on the property! Oak trees, pine trees and a rolling hills stand as the backdrop for the outdoor event space. Cows and mini donkeys are seen in the distance as you watch the sunset from 180 degrees. The Little's feel blessed to have the farmhouse and want to share their beautiful spot with many others! They hope that much laughter and new memories will be made there! The farmhouse is a 2900 sf , 1964 brick, split level ranch house that was completely renovated in 2015. The dry kitchen is ready for your caterer (In accordance with Health Department Regulations, no food can be prepared in this kitchen, however food can be re-heated). There are 2 farm sinks, oven with warming drawer, second separate warming drawer, 2 ice makers in the 23 cu-ft refrigerator , dishwasher and microwave. Just off the kitchen is the 400 sf covered carport which can be used for buffet serving or dance floor in inclement weather. You can use the farm table in the dining, for gifts. There is a handicap accessible guest bathroom just off the foyer. 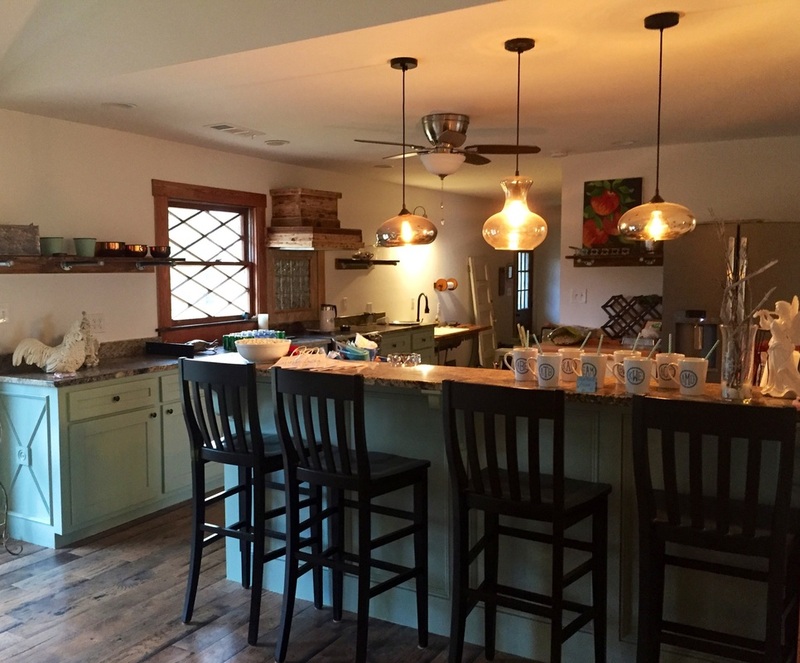 The upstairs houses the office, extra bathroom, laundry, and 450 sf bridal suite with it's own bathroom and beauty station decorated in a farmhouse chic style. Lockable closet is available for use during events. The 450 sf basement groom's quarters has a separate entrance with lounge, it's own bathroom and kitchenette. No food preparation is allowed. County noise ordinance specifies all amplified music must be reduced by 10:00 weekends (Fri & Sat) and 9:00 Sundays and your guests should depart by 11 pm ( you will forfeit your security deposit by going past this time ). Indoor/outdoor: Views of rolling hills in a 70 acre farm setting, country meadow ceremony site with additional 30' x 60' turf location perfect for outdoor celebrations. We also have a 2400 sq ft open barn pavilion. Our venue is perfect for rustic, vintage, charming and DIY simple or elaborate events. Tent rental should be on standby for inclement weather for all outdoor events. A peek into our newly renovated farmhouse. We love the new space! Whether it is a small intimate wedding, bridal luncheon, bachelorette party paint night or a picnic for the wedding party, we want to offer you the best location around. Schedule a tour and see what we have to offer!